Blogging, Twitter, LinkedIn and Facebook are all examples of social media which help you build your brand, connect with customers and conduct valuable research into your industry. Consistency is key and content is King. S Church Groundworks and Surfacing Ltd are a groundworks and surfacing company in Tilehurst, Berkshire. 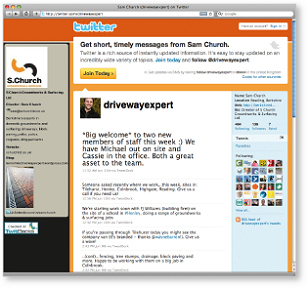 Stage one: to build a WordPress blog and fill it with content. Stage two: to create and upload blog posts on a regular basis. Nicola had already provided the content for all of my marketing collateral, with her copy being 100% perfect and consistent throughout. When she approached me to suggest social media (blogging and Twitter), I was apprehensive but understood that it was something my business should be engaging with. Nicola explained how it worked and how she could manage it for me. Within a matter of weeks, my blog and Twitter account both proved very successful, generating new business and paying for themselves. Stage one: to set up and optimise a Twitter account. Stage two: to create and manage content on a daily basis. For me, there’s no point in doing our own text as it takes too long and it will never be anywhere near as good as what Nicola can produce (in half the time!) Nicola really puts herself out to get to know your business, which shows in the text she produces. I would now describe Nicola as very important member of the team and one of the main reasons why my business has grown by 50% in the last 6 months. You can always rely on Nicola to get the job done, on time, on budget and with incredible quality. Nicola Joyce was invited to address the Fitness Industry Association (FIA) at their monthly Communications Forum in February. Speaking as a freelance journalist, blogger and copywriter, Nicola spoke about how PRs, operators and marketeers can connect with journalists and make the most of the relationship. She gave advice on what makes a good press release, how to help journalists meet deadlines and explained the process behind a magazine commission. Nicola has been commissioned by award-winning editorial and advertising photographer Karan Kapoor to write, upload and manage blog content at his site Karan Kapoor’s blog. 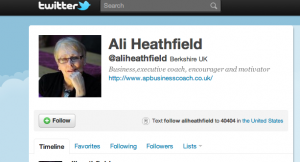 Nicola was approached by Maidenhead-based business coach Ali Heathfield of AP Business Coach and asked to work on a four-week Twitter campaign. Ali wanted to be more frequent and consistent in her use of Twitter, drive more traffic to her main website and gather a greater number of relevant followers.